I had a front row seat right of Chris and a few minutes into CTTE he motioned to the guys at the side of the stage that there was something wrong with the monitors. I think I heard him say something like 'I'm getting nothing at all!'. Anyway, with regard to the show CTTE was very powerful and I couldn't take me eyes from Chris who seemed to be a bit prickly but this only added energy to his performance. Long Distance Runaround was great but the '76 version would have better. I'm not that keen on Don't Go but In the Presence and Magnification were played to perfection and were great to hear. A real treat was Starship Trooper which you could tell the band were really getting into. Near the climax Chris was dancing around the stage and I remember Steve looking across and seeing him then suddenly sprang into life, Which you don't see too often these days. Corkscrew and Second Initial were lovely to hear. AYAI sounded really powerful, I just closed my eyes and it blew me away. Which leads me to Ritual and I'm sure you know how good that was, I don't need to say anything do I. I first heard it in 1985 and it was certainly worth the wait, guess I have to wait a little longer for that other track. All Good People? well how original to play it as an encore just before Roundabout. My friend Nigel had the good sense to run up to the front of the stage and drag me with him so we could listen to the song through Chris's monitors.....I've never heard it sound like that before. After all this though I'm left with a bitter taste in my mouth but I guess I'll have to forgive them again. 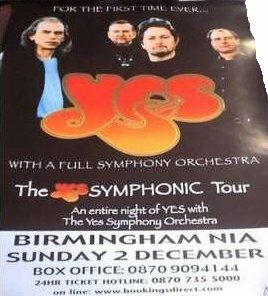 They had me standing outside the venue last year with a ticket and a sick feeling in my stomach as I read a notice to say that the gig was cancelled(saw them at Nottingham though).....It's not easy being a UK Yes fan. Well what can I say that hasn't been said already? Not a lot, although I do have a bit to say. I agree with everything that has been said. I was rather miffed that we didn't get GATES, it didn't spoil the show, I was just very miffed to think that once again we get the short straw. I missed them on THE LADDER tour because of the cancelled gig ( I was really miffed then!! ) which I was supposed to be going to but never did due to their "missing" gear, so I was really looking forward to this show and finally getting to hear GATES live and in the flesh ( not on a boot ). That is my only complaint. The show, I thought, was excellent with the band playing probably the best versions of all of the tracks they played. The orchestra was ecellent also. I was 6 rows from the front and it is a night I shall never forget. One final gripe though, I thought that the Rugby shirt was a little expensive at �40 and for that matter so was the fleece. I actually heard someone asking where the TOUR CD was. Surprisingly they were told that was only in AMERICA. See what I mean about getting the short straw. My wife thought that Steve and Chris looked really miserable like they weren't enjoying it, did anyone else notice this? Still, all in all, EXCELLENT. Could not agree more with Brian from Birmingham. I am anxiously awaiting the Glasgow show, and try as I might to be positive, I know the loss of Gates could significantly dampen my evenings enjoyment. If the song is a problem for Jons voice, why not just do it as an instrumental? I had a great seat at the NIA. Second row dead centre. This gave me a fine view of all members of the band and most of the orchestra. It�s wonderful to be able to see all of the facial expressions, especially with Steve and Chris. Of course, sitting this close has its sound disadvantages. With a whole row of bass bins just a few feet away and Chris Squire on stage, there were always going to be problems. For most of the show guitar, drums and bass were far louder than keyboards, vocals and orchestra. When Chris hit the bass pedals for the first time, it felt like a kick in the chest. The orchestra sounded very nice during the quiter parts of the show. It was good to see their enthusiasm as well. Everyone seemed to play very well. �In the Presence of� was a particular highlight for me. The drumming section of �Ritual� was spectacular. I wish that they would think of a different ending to the show. �All Good People� and �Roundabout� are so predictable and sound rather tired. Overall though, it was a great show. I�ve just sat in the second row of a terrific show, yet I have a rather empty feeling. Why? Because �Gates of Delirium� was not played. It seems that it is too much of a strain on Jon�s voice to sing every night. Well he seemed to manage OK during two tours of the States, which were both about the same length as this European Tour. It spoilt the whole night for me. I spent the first half of the show worrying about whether they would play it and the second half disappointed that they hadn�t. 1) It was the part of the show I was most looking forward to. I�ve already seen my other favourite Yes epics live (�Close to the Edge�, �Awaken� and �The Revealing Science of God�). I�ve been waiting for them play this song for years. 2) The decision to drop it for the Birmingham show is particularly annoying. A combination of bad planning and bad weather led to the last minute cancellation of one of the Ladder Tour shows here. The gig was not rescheduled and most of the fans did not get the chance to get a ticket for the other show in town as it was already almost sold out. If any crowd deserved preferential treatment during this tour it was Birmingham. 3) �Gates� is a significant proportion of the show. The tickets for this show are very expensive. When I heard the price, I saw two justifications. One was the use of an orchestra and the other was the extended length of the show. The removal of �Gates� brings the overall length down to an average level for a band of Yes� stature. It would be the equivalent of most other bands leaving out four songs. If it�s not possible for them to perform it every night, surely a replacement should be brought in earlier in the tour. The core members of Yes performed �Awaken� only 18 months ago. I�m sure it wouldn�t have been an impossible effort for Tom Brislin to learn the keyboard parts and someone to write a score for the orchestra. On a purely mathematical level, the omission of the song reduces the set length by about 15%. Perhaps they should hand out �5 notes to the fans as they leave. I spoke briefly to one of the roadies on the way out. He speculated that the band were saving �Gates� for London. That�s not a lot of consolation if you�re not going to a London show. I have a ticket for Nottingham on Saturday. I�m not hopeful that they will play �Gates� that evening. I think that Glasgow on the following night is a better bet. I urge anyone going to the Nottingham to take a banner or a piece of paper with �Gates of Delirium� written on it and to hold it up between every song. I�ll be down the front with mine. Just got back from Birmingham. Another stunning concert, but still no "Gates"! "Close To The Edge" sounded more cohesive than Manchester, and overall the sound has improved. Tom Brislin seems more settled particularly on "And You And I", a number which I never get bored of hearing live, because it's performed solovingly. I was sitting right on the front row, directly in front of Steve Howe. "Corkscrew" was devastingly beatiufull and "Second Initial" was simply fantastic. "Starship Trooper" is worth the ticket price alone, and anyone Yes dan who has since Ritual performed live has not lived. The audience went beserk for "Seen All Good People" and "Roundabout" much to the bewilderment of the secuirty staff! The absence of "Gates" from tonights show did not dampen the atmosphere whatsoever. Mind you, it's easy for me to say that because I am seeing the final Manchester show! Don't let down lads!! 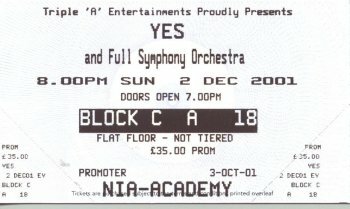 Seeing Yes for the 25th time since 1978 last night was somewhat of a bitter pill to swallow as we had been promised a live endition of The Gates of Delerium. No Gates appeared and only a two hour ten minute set - we all left bitterly dissapointed. Jon Andersons' voice was as immaculate as ever, Steves' guitar playing was great, as was Alan on the drums. Chris Squires bass work was abit wayward at times. Ritual and Close to the Edge were stunningly produced on-stage. The audience - around 5-6000 were quiet and the show did not quite "click". As for the non appearence of The Gates of Delerium - thanks for nothing chaps - we'd longed to see that for 23 years!